Got a tough situation in your life? Your astrological yod can tell you all about it! Everyone wants to live a good life and have healthy relationships. However, life is full of obstacles and being in a relationship isn't always perfect. Issues and problems will come up. How do you figure out what they are so you can work on them? Astrology and your horoscope may be able to shed some light. You can start off by knowing your and your partner's natal chart. Below is a drawing of my own (courtesy of Astro.com, which can compute yours in a matter of seconds). If you can't tell or are not familiar with this chart, the "yod" is pretty prominent on my horoscope chart. It's the long skinny triangle like a witches' hat, outlined in green, with a blue bottom. At the long end of the triangle is the planet Saturn, indicated by a cross with a curvy bottom, at the very bottom is the planet Neptune, whose glyph looks like a trident, and the third member of the yod is the planet Uranus, indicated by the glyph with the ring shape on the bottom and the two outward facing arms. It's next to Pluto, which is symbolized with a P.
The classic astrological yod is known as "The Finger of God". It is defined by the two bottom planets — in this case, Uranus and Neptune — being 60 degrees apart and each one being separated from the apex planet by an angle of 150 degrees. Other yod configurations can exist with different angles, but this is the classic one and the one most astrologers mean when they tell you, "You have a yod in your chart." The main thing that makes a yod a yod is the long, skinny shape of the triangle. A broad-based triangle with all the sides and angles the same is a "Grand Trine," which isn't the same thing at all! Most astrologers agree that if you have a yod in your natal birth chart, it is a very big deal. “I strongly believe that Yod astrology is very significant and does live up to the hype as a very fated aspect pattern denoting a special mission or destiny in life," says Australian astrologer Jamie Partridge. “When you have something in your life, whether it is a relationship or a business that kind of works—sometimes good and sometimes not so good—but cannot be easily steered in any one direction, then it is probably propelled by a quincunx energy. A Yod pattern is a bit more connected than a quincunx as it has a sextile aspect as part of the pattern, which can facilitate communication and bring in opportunities. The Yod in Astrology can create events, incidents, relationships etc, that occurs in a person’s life not out of their choice but in a karmic manner. These circumstances usually come as an opportunity and eventually turn out to be a blessing or a curse. “A Yod can bestow gifts like a talent or a higher intelligence, bring about an unusual situation or sharp turns in life that cause steep ups and downs. The overlapping factor in all these instances is that the person doesn’t have much control over what can occur and it can be negative or positive. Real or imagined, there is a feeling that another force behind is controlling the show. During these incidents when a person realizes their extraordinary gift, or when one suddenly becomes rich or poor, or when they find themselves in very unusual circumstances, there is usually a transit or progression that triggers the Yod energy, and the planets, sign and area of the chart involved in the Yod and those involved in the transits determine the nature of the outcome." "The T-Cross sets out a problem and pushes you to find a solution in the ‘empty leg’ of the cross. The Yod just pushes you and the solutions are seldom simple. It’s not nicknamed ‘The Finger of God’ for nothing." So, if you find a yod in your birth chart and horoscope chart (if you have either one), here are 4 clues on what it means for your life and relationship. The yod is a mystical symbol of a problem, issue, or conundrum in your life. The two sextile planets talk about something you need or want to do, but the apex planet reflects something that keeps getting in the way. Sometimes, in a relationship astrology reading, one partner has a planet that, when the two charts are superimposed, combines with the other partner's yod to form that partner's boomerang. I have had this occur reciprocally in a relationship I had: We both had yods and each apex planet made a boomerang with the other's yod! This was extremely significant and helped me understand the relationship problems we were having. Any planet currently passing over the apex of the yod reflects a time in the life when circumstances cause the issues described by the yod to come to the forefront in life. When this happens, something big generally happens in a person's life or in the life of the relationship, if it's a relationship reading. A planet attached to the apex of the yod is commenting on how the problem came to be in the first place, especially if the angle degree is considered to be stressful or unfavorable. For instance, I have four planets connected to the long end of my yod triangle by a 90-degree angle known as a "square." These aspects describe problems I had growing up, how they are affecting me now, and what's keeping the relationship from working out. So, in the astrological yod, we have a complete description of an important problem or issue in a person’s life — especially if there’s a boomerang, or if another person’s chart contains a planet that makes a boomerang with the yod. A good astrologer who asks you the right questions can tell you what the problem is, how it got started, when in your life the issues are going to become important to you, and what to do to resolve the issues. How can you even know if you have a yod or not? A quick way to find out your is by going on Astro.com and putting your birth data in where it asks you to. When the chart comes up, if you have one (or more!) yods, they will show up, like mine does, as a tall skinny triangle reaching across the chart, outlined in green. 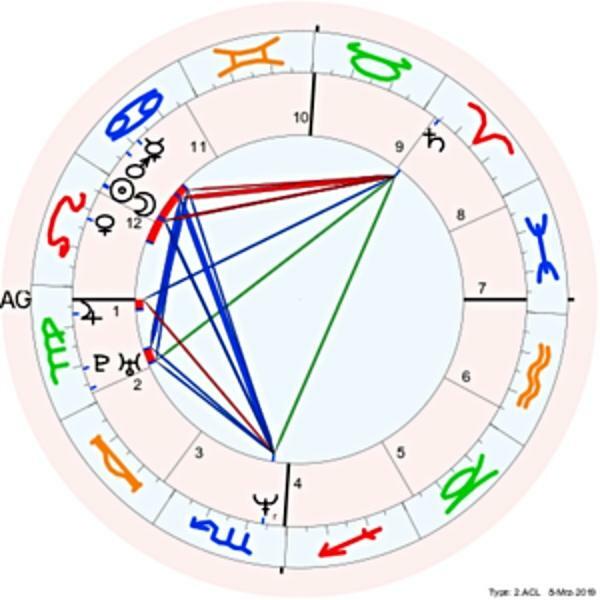 If you are having ongoing difficulties you just can't seem to resolve, like custody battles with an ex, problems pushing yourself to finish that novel you've always wanted to write, or a love relationship you just can't seem to get straightened out, see if you have a yod in your birth chart. It might hold some important clues for you. P.D. Reader, a student astrologer, blogs as The Thinking Other Woman. On the blog, she shares advice about affairs, relationship problems, astrology and more. This article was originally published at The Thinking Other Woman. Reprinted with permission from the author.